Interested in helping feed the wildlife? Help us by providing the funds and we will make sure they are fed. On behalf ot the wildlife...Thank you! If using a credit card, debit card or PayPal please click the donate button below. Robert & Catherine Waple North Lanarkshire, U.K.
Sold Out***While Supplies Last***Sold Out! 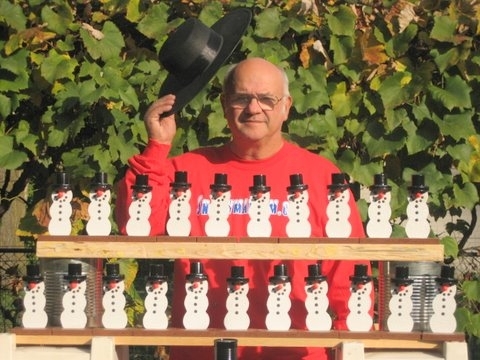 Anyone donating $50 or more can receive a hand made snowman, built by Italian craftsman Richard Guccini. These are truly one of a kind. Each one is numbered and signed by Richard himself. A must have for any Snowman Cam fan. Send an email after donating to let us know you would like one. Otherwise all of your donation will be used for food. Anyone donating $25.00 or more can also receive a special message on the Snowman Cam for all the world to see. Happy Birthday, Happy Anniversary, Will you marry me?, your website address, or anything you'd like.